In their ruddy jackets of leather that reached to their knees the men of Erl appeared before their lord, the stately white-haired man in his long red room. He leaned in his carven chair and heard their spokesman. And thus their spokesman said. ‘What would you?’ said the lord. ‘We would be ruled by a magic lord,’ they said. The King of Elfland’s Daughter is a dreamy, colorful, exceedingly British literary fairy-story for adults; it’s a crucial antecedent to the Lord of the Rings, Lovecraft, and other early purveyors of rich prose and high fantasy. I’d been meaning to read this ever since I started delving into Tolkieniana in high school, and saw it discussed in one of Tom Shippey’s essay collections, and finally invested in a personal copy when Seek Books liquidated a few years ago (alaaaas). Previously, I’d only read one other bit of Dunsany – one of his short stories, likewise in a Shippey anthology that I picked out in high school. I remember the story as being pleasantly swampy, and involving big swords, at least one lizard-monster, and monolithic architecture. Great; carry on. Elfland unfortunately I found a slog to get through, which is one of those things that makes one feel jaded. About once a chapter there’d be a human insight or a wondrous image that made me smile; the rest of the time, I found it terrifically cloying, and poorly paced and motivated. It seems to stagger back and forth in the territory between overexplained high fantasy and mystifying fairy story, such that it’s neither quite weird enough to fly free of expectations of logic, nor quite grounded enough in recognizable motivations to feel like much more than a succession of elaborate tableaux. I’d also argue there’s something rhythmically off about the delivery of the fairy-story elements, where the repetition and flow fail to build the kind of irrefutable dream-logic that pulls good mythos onward, but this could be a secondary symptom of my dislike for Dunsany’s writing on the sentence level. The allover layer of pastoral treacle is what did me in from the beginning. (e.g., “little tinkling songs” above.) I have a tolerance for British plumminess that easily tips over into an embarrassingly active enjoyment (see: my ability to repeatedly reread Richard Adams’ epic fantasies), but Dunsany overleaps plumminess and stands firmly in the Land of Preciousness. So many buttercups. Returning to the idea of generic contributions: it was interesting to recognize the eventual moral bent of the narrative – where magic/sense of wonder is a good in and of itself, and its restoration to a land is a triumph – as one that I had previously thought of as typical of later fantasy. (McKillip does this a lot, for example.) That is, I see that story structure as deeply indicative of a genre that is both conscious and defensive of itself of as a genre. 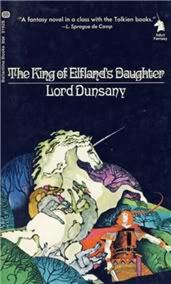 It makes sense, then, that Dunsany would stand as a precedent to Tolkien et al. not only in style, but in literary ethos. Ohhh… maybe on second thought, I’m actually hankering to read this any more :( I feel like I could put up with many imperfections but poor pacing and cloyingness kills it. To some of your points, I think Lud in the mist is still a really great candidate for well paced, thoughtful high fantasy. Still shallow in parts, but also ultimately a rumination on magic and moral. I don’t think you could deal with this. I actually felt like I was punishing myself by persisting in reading (started thinking longingly of all the other books I could be reading with that time … ), and it’s fewer than 200 pages long. I suspect Dunsany is much more fun at short-story length. Oh gosh, after Old Kingdom blitz I might need a break from fantasy, but perhaps Lud ought to be bumped up my queue later in the fall? I loved this novel(my memory of it is fading, although it is still sitting on my shelf), but I suspect Emera’s tastes are much more sophisticated than mine. I’m very open to the possibility that they were oversophisticated in this case – I felt like I was disappointing my younger self with my reaction!